When Stephen Constantine announced the probable list of 30 players for the upcoming Intercontinental Cup, fans were excited to see FC Pune City’s youngster Ashique Kuruniyan getting his maiden call up to the senior team. 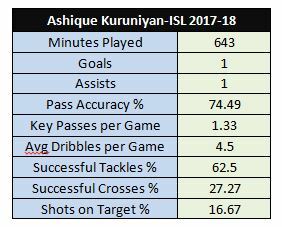 One of the best emerging young players in the ISL 2017-18 season, it is great to see the youngster getting an opportunity to prove himself at the highest level. However, with the number of players set to be reduced to 23, some players will have to leave the camp soon. Does his performances in the ISL merit him a spot in the National Team? Let us try to find out using a statistical analysis, comparing him with a few of the other players who have also made it to the camp. Ashique started his footballing career as part of a talent scheme of the Kerala Football Association (KFA) to find talented young footballers for the future. He trained with the KFA until getting selected by Pune FC in 2014 to join it’s academy after impressing in an open trial. He played a major role in Pune FC’s brilliant 2nd place run in the 2014-15 U-19 I League season and also appeared for the AIFF U-18 team that participated in the FAM-Frenz Asia Champions Trophy, scoring a wonderful long range goal against Chonburi FC. He received his first official international call-up when he was a part of 23-man squad to Palestine for the U-19 AFC Championship qualifiers in 2015. When Pune FC shut down and the academy was taken over by FC Pune City, Ashique was also a part of the merged academy. In October 2016, Ashique received the opportunity to train with the academy team of La Liga side Villareal CF and he spend 4 months there- scoring a few goals and even captaining the side once- before returning home due to a hamstring injury. This year, the 20-year old had his breakthrough season with the FC Pune City senior side, making 9 appearances in total and scoring once, in the 5-0 rout of North East United FC in December. He also featured in Pune City’s 3-2 defeat against Shillong Lajong in their solitary Super Cup fixture. 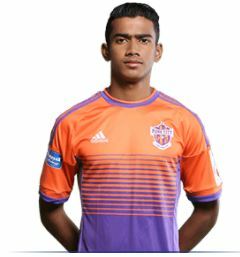 Ashique started the initial games as a left winger for Pune City FC but soon he was shifted on to his much favoured right side. In his earlier days, he used to mostly play on the right, cutting inside to unleash his lethal left foot. However at FC Pune City, the presence of 2 of the league’s best finishers in Emiliano Alfaro and Marcelinho meant that his natural impulse to shoot on goal was considerably trimmed down. This is evident from his minutes per shot on goal stat: he took a shot every 53.58 minutes, while Marcelinho attempted a shot every 28.07 minutes. However, he succeeded in nailing down a regular place in Ranko Popovic’s system due to his ability to link up well with the other attacking players of his side. Although he had just an assist to show, he had a passing accuracy of 74.49% and an average of 1.33 key passes per game. Putting it into comparison with some of the other players called up to the National camp, Bikash Jairu and Alan Deory had passing accuracies of 68.24% and 68.54% respectively, while Len Doungel and Holicharan Narzary had figures of 72.08 and 74.02 respectively. Moreover, he likes to take on defenders and has proven to be a far better dribbler of the ball than the likes of Jairu and Deory, with 4.5 dribbles attempted per match with a success rate of 51.21%. Out of the wide men in the probable list, only Doungel has attempted more dribbles per match but he failed with 47 of his 81 attempts. Leaving aside the more experienced players like Sunil, Jeje and even Udanta, one advantage that Ashique has is that he is technically better and could be a better option for linkup plays than the others. Another aspect of his game that is often overlooked is his defensive work-rate. Constantine loves players who work off the ball and Ashique would definitely suit his bill simply because he rarely shies away from his defensive responsibilities. During the ISL season, he won 51.67% of challenges and the closest any of his fellow National Team wingers comes is Narzary with 48.8%. The rest, although tracked back, failed to win even 40% of their challenges. Ashique was also decent with his tackles, making 2.67 tackles a game and got 62.5% of them right. Therefore it is safe to say that Ashique’s selection for the National Camps is not unwarranted; he is the kind of player that Stephen Constantine has constantly preferred for the National Team and given his technical superiority over some of the other probables it is highly likely that Ashique will make the cut for the Intercontinental Cup. This entry was posted in Football and tagged Ashique Kuruniyan, FC Pune City, Football, Indian Football, SportsKPI. Bookmark the permalink.